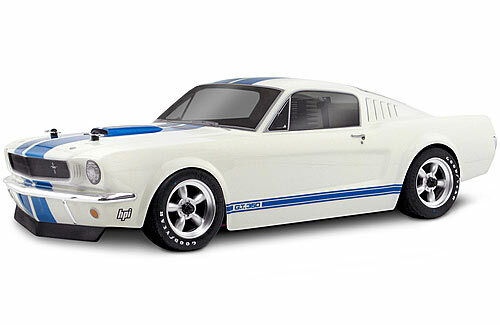 All Products > "17508 HPI 1/10 Shelby GT350 Body 200mm"
The 1965 Shelby GT-350 is one of the most famous muscle cars ever. Tuned by Carroll Shelby for extra horsepower, improved suspension, performance-inspired body modifications, distinctive paint, and special Goodyear Blue Dot tyres, the Shelby GT-350 went on to create a legendary history of success on the race track that continues today at vintage racing events around the world. 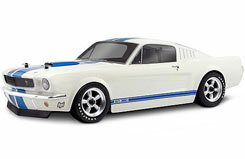 Fans of the �65 Shelby GT-350 can now own a realistic 1/10th scale replica that fits perfectly on most 200mm touring cars. We've captured every detail from the classic Shelby Mustang lines and stance down to Goodyear Blue Dot tyre decals, this is the most realistic Shelby GT-350 body ever made for R/C Touring Cars!